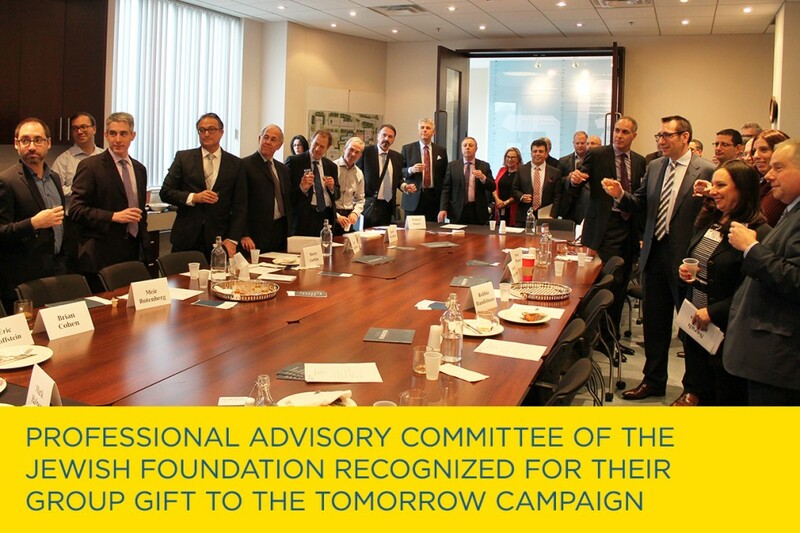 The Professional Advisory Committee (PAC) of The Jewish Foundation of Greater Toronto – UJA Federation’s planned giving and endowment arm - was recognized for their group committee gift to the Tomorrow Campaign at a special L’Chaim on December 16, 2015. The Tomorrow Campaign is UJA Federation’s capital initiative that continues the tradition of building infrastructure to preserve and strengthen Jewish identity and culture. This generous gift is an excellent example of how a group of committed and passionate people can come together to make a tremendous impact in our community. “Raising infrastructure funds on the scale required for the future health of our community can certainly prove a daunting task,” says Joel Cuperfain, Immediate Past Chair of PAC and VP & Estate Planning Specialist at RBC Wealth Management Financial Services Inc. “It took a lot of vision to see what the needs were going to be some 15 years ago when the Tomorrow Campaign was founded. As proud members of PAC, we felt that true leadership was about more than introducing potential donors to the Jewish Foundation. We wanted to come together, as a group, and be part of a commitment to excellence in a campaign that will define our community for decades to come. Applying the fundamentals is what advisors do. We all believe that building centres of Jewish life in our community is one of the absolute fundamentals”, PAC consists of a dedicated group of lawyers, accountants, financial advisors and insurance brokers. The PAC Jewish Foundation Suite is within UJA Federation’s Alex & Genia Grossman Family Headquarters, at the Lipa Green Centre for Jewish Community Services on Sherman Campus. Guests at the L’Chaim ceremony were also thanked for their overall contribution and dedication towards UJA Federation’s Jewish Foundation, Annual Campaign and Tomorrow Campaign.